I'm fascinated by how these things work - I would have thought that most people wouldn't have much choice in when they travel. Yet there's so much evidence that they do. I think some members of the public are also cynical about the fact that this toll will favour rich people and put an even greater burden on working class people. Not to mention that many people's jobs aren't as flexible as they'd like, which may impact on the elasticity of demand. However, as you pointed out, the data stands to be seen. I find it to be another monetary scam. Most people whom utilize these toll area's today are already getting ripped off. Charging extra proves nothing to the environment just allows government to access more funding for projects that already have funding. If anyone believes that this action is environmental friendly is kidding themselves. This country makes plenty of money with their made up monetary schemes. Next they will be charging you per person in a vehicle at one given time. What a joke. If the revenue generated was put back into public transport and/or non-consumptive road networks like bicycle ways, then I would say this is a good idea. In Japan, the use of bicycles are high in both rural and city areas, far greater than back in Australia. This is one reason (among many) why Japan has a smaller per-person ecological footprint than Australia. It is something I think Australia can learn from as a developed nation just like Japan. Also interesting is those who have to cross over the Harbour and do not go into the City at all. 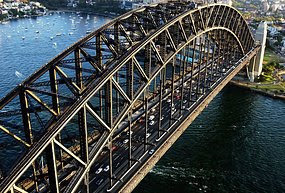 If you live on the Northern Beaches and for example work as a tradie and need to be on a job site say in Alexandria you have to go over the bridge or tunnel. These people are not going into the city but if travelling in peak times will be slugged the extra fee. I am all for supporting projects that encourage people to use their car less but this needs to be balanced with projects supporting people to use public transport - so the government stops the Manly jetcat??? I am happy to pay the extra fee if I have to drive into the city and even past the city BUT ONLY if all the money goes towards making it easier for people to use public transport. David I am interested in hearing what you think about yesterday's announcement of the encomomy stimulous package. Do you think this will help and what advantage will it be for our environment?? If it's to be genuinely neutral, considering peak times have the greatest number of cars pass through, it wouldn't be a case of $1 more for peak times and a $1 less for non-peak times (unless the number of cars in peak times equals the number of cars outside of peak times). Likely it would offset a larger component of off peak toll. I would think the increase in peak hour tolls would be best put towards capability building in public transport infrastructure.